Imagine an interactive directory that your members update themselves! FellowPages a great way to build community for your organization. Members increase their communication with each other as well as with the organization. Why should my organization sign up for this directory? There are many reasons but one of the best is the ability to find other members by only knowing a little information about them. Say you can only remember someone's first name, like, Charles. Search for "Charles" in the directory and you can choose from the photos which Charles you want to contact. But I know all the members of my organization...and they know me. Really? What about new members? 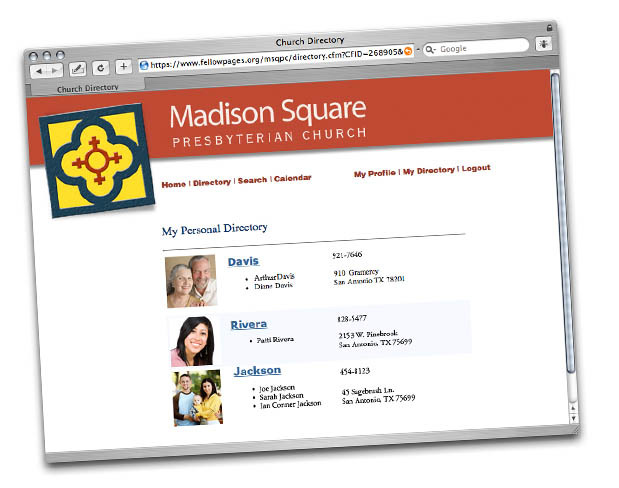 The directory is great tool for them to use while getting acquainted with the group. And Besides, FellowPages is so much more than just a directory. Think of it as your own private communication tool, like YahooGroups or MySpace, only without all the spam and popup ads! We already have a web page. FellowPages is not meant to be your web site. FellowPages should simply be a link on your own group's web page. If your organization doesn't have a web site, we'll provide a direct link to the directory for members to use. You are in control of your own information! You can hide or show any information you want and ONLY members of your organization can see the information you choose to share. All information on Fellowpages is password protected. You have your own private password which you can change at any time. The information you provide to the directory will NEVER be sold or given to anyone. What if I don't want some of my info to be displayed? You don't have to show anything you don't want to! Of course, the point of the directory is to increase communication between members. So the more info you share, the better off the group is. Does our organization have to download any new software? No. All interaction with the directory is done over the web through any normal browser. Who takes care of updating our organization's information? The information on FellowPages is input by the members themselves. Your organization will also have an Administrator (or several) who will be responsible for adding and deleting members as well as permitting or denying requests for calendar entries. What kinds of things can the Administrator do? One of the most helpful features of FellowPages is the ability to send email alerts or announcements to all the members at once. You probably do this now through your email program. The big difference is that the Online Directory keeps all the email addresses up to date! Here are some other things an Administrator can do. Can we generate a printable file? Yes. The roster can be printed directly from your browser. The date is included so you know when to throw old roster away. Can I save my favorites for quick access? Yes! Under the "My Directory" button you can view your favorite folks. Add or delete people at any time. Is it hard to change my picture? We've made it about as easy as it can get. It's a 3-click deal. Our system even resizes it for you so it's quick for others to look at. For member based organizations, the cost is $3.65 per member per year. That's only 1 cent per member per day! For family structured organizations (such as churches), the cost is $3.65 per family per year. That's only 1 cent per family per day! To get going, all you have to do is call or email us. We're located in San Antonio, Texas. Ask for Jack, Ansen or Doerte.